HG Awareness Day, also known as Hyperemesis Gravidarum Awareness Day, is being observed today! It has been observed annually on May 15th since 2012 to raise awareness of a dangerous and chronic condition that plagues many pregnant women. Here is Mummykind’s H to G (well, more A-Z!) 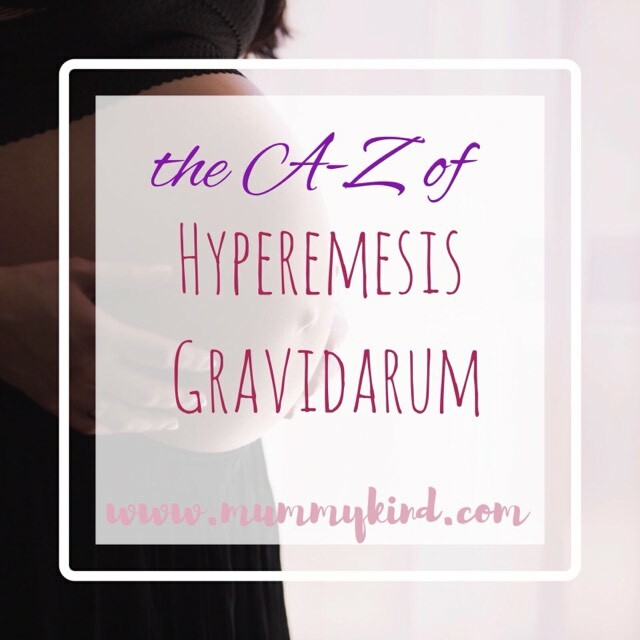 of Hyperemesis Gravidarum for HG awareness day! H– Hospitalisation – In more severe cases of HG, a woman may require hospitalisation. Treatment for this may include tube feeding and intravenous fluids to restore lost nutrients and hydration to both mother and baby. Y– You. As an individual you know the limit that you can get to before needing help- bare in mind that with another little life thrown into the mix, you may need to seek help more quickly than you would do if you only had yourself to look after. A good rule to stick to, is if you’d need a doctor for a condition if you weren’t pregnant, you definitely need one if you’re are pregnant. Self care is important, look after yourself! P– Peppermint – Interestingly peppermint tea can be used to combat nausea and often can alleviate sickness symptoms, even if only for a short while. However using mint toothpaste is one of the biggest triggers for nausea in pregnant women! E– Everybody – HG does not discriminate , an body can fall victim to Hyperemesis and it’s debilitating symptoms. R– Royalty – Kate Middleton, the Duchess or Cambridge has suffered with HG and Severe morning sickness with all three of her pregnancies. Although I hate to think about how unwell she must have felt and how hard it must be to suffer HG in the public eye- I’m very grateful for the awareness she has raised for this debilitating condition! E- Emotions – Hyperemesis gravidarum can make sufferers unable to do even the most basic of tasks, simply going to work can be impossible for some women. This makes many sufferers feel depressed and unhappy. These feelings could develop into postnatal depression, so it’s a good idea to seek support with a counsellor or see a doctor for anti-depressants. M– Morning Sickness – 80% of all women experience morning sickness in the first 3 months of their pregnancies. only 2% of pregnancies are affected by Hyperemesis Gravidarum. E- Empathy – If someone in your life is experiencing HG try hard to be empathetic. Offer to help when and if you can. I faced so much stigma when I had HG because people around me just didn’t understand. The last thing a lady suffering from HG wants to hear is “well, I had morning sickness and I was fine.”… HG and morning sickness are worlds apart!!! S- Sickness – About 45% of pregnant women suffer from nausea with vomiting while an additional 25% suffer with nausea only. I- Impact – Thankfully there are no known links between HG and adverse effects for the foetus. S – Safe – There is a significant decreased risk in fetal loss among women with HG versus women who do not vomit during pregnancy. G- Go Galllll! – Hyperemesis is debilitating, if you’ve had HG and you’re here to tell the tale (or been brave enough to go on and have another baby! )- give yourself a massive pat on the back. You’re so much stronger than you know! R- Rest – Bed rest is commonly prescribed to women with the HG and can be vital in helping to regain strength. A- Amy – Mummykind’s own Amy and Harriet have experienced HG first hand. V- Vomiting – Lightheadedness, nausea, fatigue, exhaustion, dehydration, vomiting and fainting are the most common symptoms and characteristics of HG. I- IV – In severe cases of HG intravenous fluids have to be administered under inpatient conditions to keep ladies and their unborn babies hydrated. D- Differences – Those with morning sickness suffer from nausea, but may not always experience vomiting. Usually, the condition lasts during the first trimester, yet some women experience it beyond the initial 12 weeks of pregnancy. Women who do vomit are unlikely to become dehydrated. In contrast, HG results in severe vomiting and, for some women, constant nausea. The condition can last for the entirety of pregnancy and can lead to extreme dehydration. It can also result in the loss of 5 percent or more of a woman’s pre-pregnancy weight and aversions to certain foods. low birth weight in the baby and premature birth. n to experience it in their next. U- Untreated – Fortunately, unborn babies won’t be affected unless the nausea and vomiting goes untreated for an extremely long time period. The majority of babies will get the nutrients they need from the reserves stored in their mother’s body at the mother’s expense – this means her teeth and bones can become brittle, and her hair and skin can become dry and dull. M- Motion Sickness – Traditional Motion / Travel Sickness remedies can often be beneficial to women suffering from HG. Peppermint and ginger teas. Ginger products like sweets, gum or biscuits and even anti travel sickness wrist bands have been used by women to ease HG symptoms. Glad you found it useful! I, too, had no idea about hyperemesis until both Amy and Harriet suffered with it in their pregnancies!